There might not be much of a safety net for Netflix shares this week, one technician warns. The streaming giant is expected to announce first-quarter earnings after Tuesday's closing bell. The highly anticipated report — for which the options implied move is about 8% in either direction — comes on the heels of Disney announcing that it would launch its own streaming service in November, adding to Netflix's list of soon-to-be large-scale rivals. Shares of Netflix headed lower Friday and again Monday, on worries about competition from Disney. Technical expert Carter Worth said those moves could be a preview of what's to come for the stock. 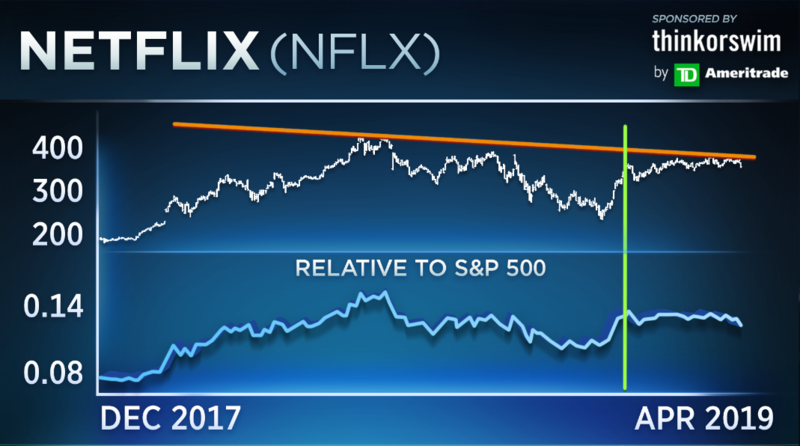 "[The] action obviously has nothing to do with anything other than a big competitor joining the ring, but what's important here about Netflix is how poorly it's been acting over the past one, two, three months and more," Worth, chief market technician at Cornerstone Macro, said Friday on CNBC's "Options Action." While he acknowledged that Netflix's stock is "one of the great winners of all time," having climbed about 29,000% since its IPO in 2002, Worth warned that its typical post-earnings action is notably volatile. "What we know is it comes out of the gate and drops 72% — right out of the gate after its IPO. Advances considerably; drops 78%," he said. "And we've just endured a 45% decline with the peak-to-trough drawdown when the market dropped [late last year]." 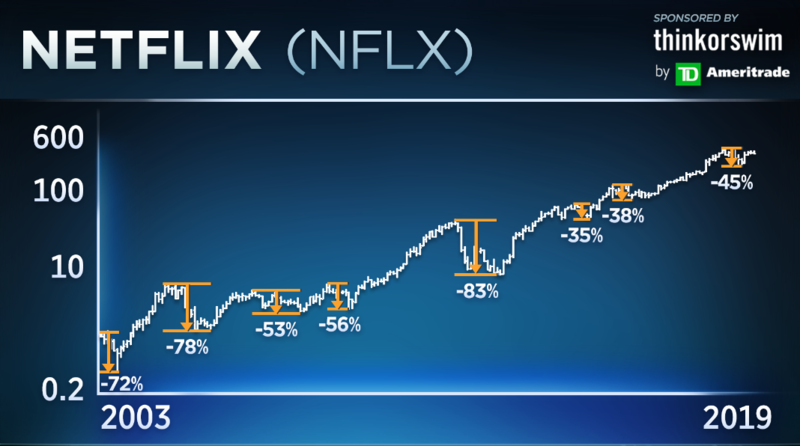 That action, paired with the stock's recent series of lower highs, suggests that Netflix could be about to make a similar kind of move, Worth warned, pointing to another pair of charts to cement his theory. Noting how many times Netflix has failed to break above its trend line, represented above in orange, Worth also highlighted exactly why the stock's tepid action in recent weeks worries him. "What we know ... is that, yes, Netflix advanced off the low with the market and has advanced generally since, but what we also know is that, yes, it advanced initially, but it has underperformed ever since," the technician said. "That's, I think, the setup that is the cause for concern. I think it's risky to go into earnings long, at least full long. I'd reduce or buy puts or some other strategy to protect oneself." Shares of Netflix fell by more than 1% in early Monday trading, but are still up nearly 30% year to date.